I was running. And I had the ‘Curry Burps’. Yep, definitely a ‘Curry Burp’. 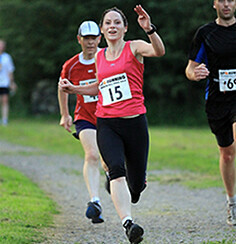 I carried on running … and munching on the curry flavour energy bar I was carrying. I hadn’t known what to expect when I’d read that MuleBar were making 'Eastern Express' - a curry flavoured energy bar. Don’t get me wrong. 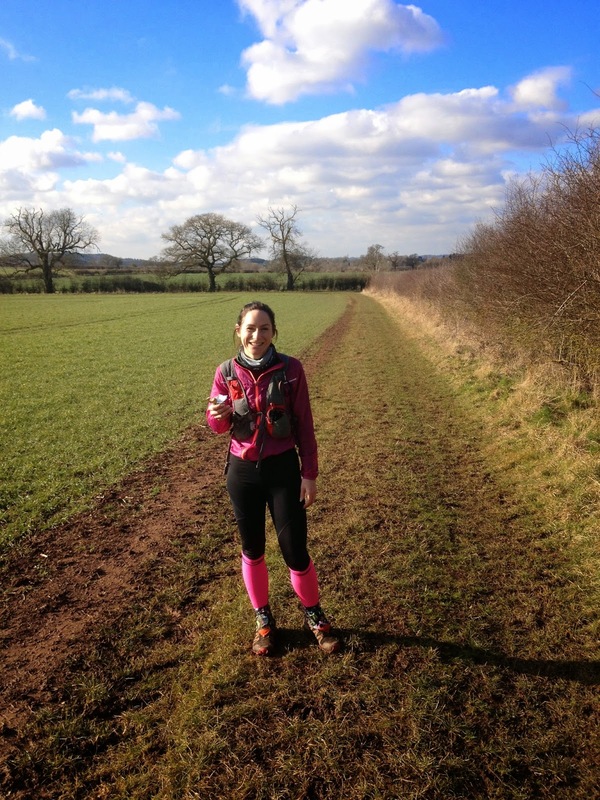 I’m ALL for snacks on the move, but the idea of my weekly takeaway making it onto my long run – even in bar form – was something entirely unexpected. This didn’t mean I was adverse to giving it a go though. Curry in a snack form. Could be my new favourite thing. Opening the wrapper, it looked much like any other energy bar ... except slightly orange. And with neon green pistachios. Ok. It looked like any other energy bar IF you were colour blind. But taste-wise, it was winning. It was definitely something new. Every mouthful had a zing of curry and the pistachios gave it a nutty balance which wasn’t unpleasant. In fact it was downright tasty. And reminiscent of Friday nights. If they could make a naan flavoured bar which I could eat as an accompaniment, I may even be tempted away from ‘India Kitchen. The curry burps whiled away a happy hour or two on a long canal path run. I got to have a run, look at some nice scenery and enjoy the equivalent of a a curry on the move. And without the worry of spilling it down my front. Curry on the run ... pre-curry burps. I will be buying these and alternating them with my usual flapjack bars. And when I’m running long miles in the dark and cold, I can pretend I’m sitting in the warm on the sofa with a takeaway on my lap. The bar is NEON coloured. 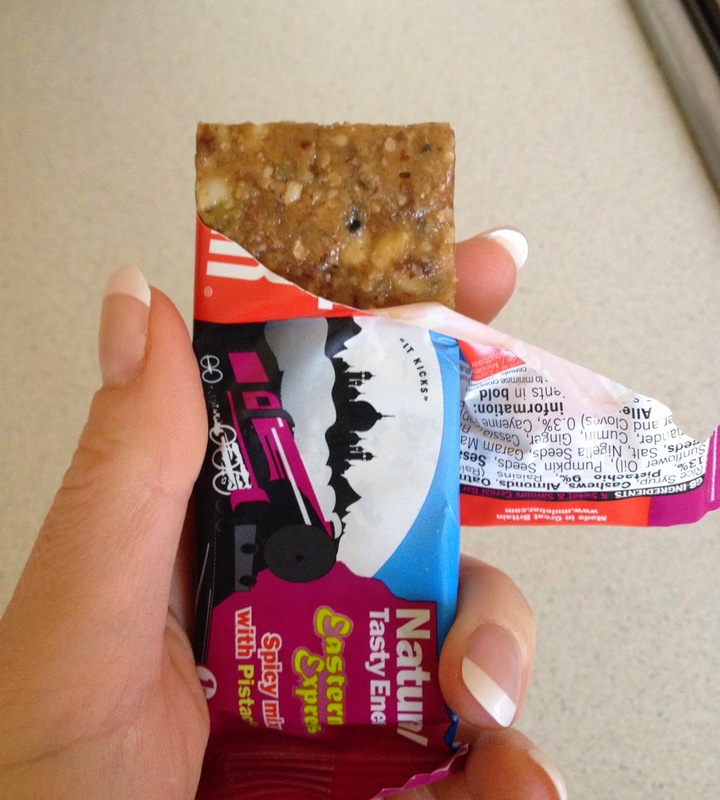 It’s a lot tastier than many other energy bars but it’s not overly sweet either. The bar is slimline. I could fit a lot of these in my race vest. Packs a good amount of calories despite the slim size. Great for ultras when I want some calorie dense food on the run. Eco friendly - all the MuleBar energy bars are wrapped in a unique compostable wrapper. Fairtrade ingredients are used in their energy bars & ReFuel protein bars.Organic ingredients accredited by the Soil Association are used in the MuleBar energy bars and Kicks energy gels. The company started after Jimmy and Alex went on a trip to the Andes in 2002 and were supplied with some energy bars by their guides which made their stomachs bad. They decided that they could make a better product than these … so they did! Winner of The Natural and Organic Awards 2010 for Best New Sports Nutrition Product. Awarded 10/10 by Cycling Weekly. Cycling Plus 2010 Nutrition Awards. *MuleBar sent me a pack of their Eastern Express bars free. As per usual I was 100% honest. I liked them. If they tasted like curry vomit I would have said so. They didn't. Curry burps totally win. :-D Great Review! I picked this up from the MuleBar site and I've got to share it with my friends. Love it! Plus I love MuleBars. They are delicious. Every flavour is unique and they're all great. Thanks David! I was pleasantly surprised by the Eastern Promise bar! It was delish! Haven't tried any other flavours yet ... can you recommend some nice ones?